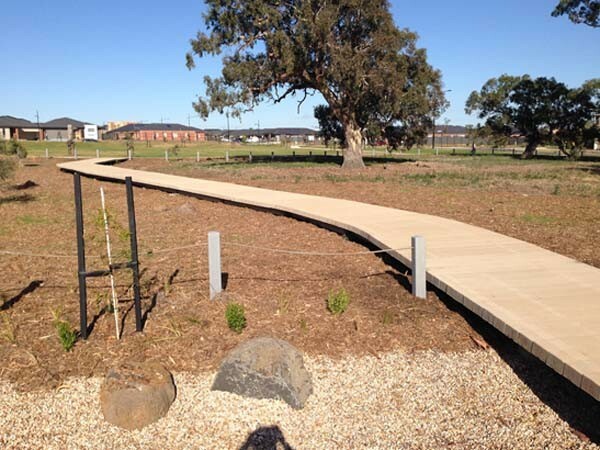 Commercial landscaping specialist Warrandale Industries installed the PermaTrak modular boardwalk system from Rocla at a new recreational development site that also held cultural significance for the Wurundjeri Tribe. Commissioned by Peet Limited for Hume City Council in Craigieburn, Victoria and executed by Warrandale Industries with Urban Edge Landscape Architects serving as the Landscape Consultant on the project, the recreational development features a playground, walking paths, picnic facilities and shelter. Warrandale Industries’ Project Manager Tim Buruma explained that the cultural management plan for the site had identified the land as being culturally significant for the Wurundjeri Tribe, which meant any major ground disturbance had to be avoided. Urban Edge Landscape Architects specified the Rocla system which, given its weight and design, suited the conditions and fulfilled the requirements for all parties. The Rocla PermaTrak boardwalk system was laid along a 50m path as part of the development. Though he was aware of the Rocla PermaTrak boardwalk system, Tim said he hadn’t previously installed it. The installation was straightforward and Tim is confident he would use it again. The local community is very pleased with the new facility, which was officially opened in early April. Rocla PermaTrak is a cost-effective, modular concrete walkway system suitable for recreational walkways, cycleways and footbridges. It can be installed in all types of environments from arid through alpine to coastal terrain, including deserts, riverbanks, wetlands, mangroves, beaches, rainforests and caves. Featuring precast concrete components that provide strength, design flexibility and a long, trouble-free life, Rocla PermaTrak is quick to install and can be extended or relocated at any time.